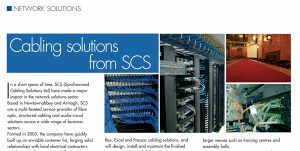 In a short space of time, SCS (Synchronised Cabling Solutions Ltd) have made a major impact in the network solutions sector. Based in Newtownabbey, SCS are a multi-faceted service provider of fibre optic, structured cabling and audio-visual solutions across a wide range of business sectors. Formed in 2003, the company have quickly built up an enviable customer list, forging solid relationships with local electrical contractors together with clients such as Belfast International Airport; BT; Northern Ireland Tourist Board; Ulster, Lagan Valley and Armagh Hospitals; Trinity College, Dublin; BIFHE; NDAI; SELB, NEELB and WELB. Technically strong, with a commitment to servicing their clients’ requirements, from pretender drawings to installation and servicing, they offer the complete package.